Between the 7th July and 30th December 2017, eighty 21st century British Paintings will go on display in 4 Chinese art museums for the very first time. No.20, Hai An Road, Zhi Fu District, Yantai City, Shandong Province. Along with the exhibition, a number of the exhibiting artists (including Marco Cali, Julian Brown, Lucy Cox, Judith Tucker and Freya Purdue) will go out to talk on the subject of British painting in light of the digital revolution and explore why the hand-made work of art is more relevant today than it has ever been, connecting directly as it does with the profound human need to touch, feel and mediate emotion. Because painting’s rising relevance in the 21st century is beautifully aligned with the resurgent growth of interest in vinyl records, knitting, film photography and unplugged music. In this new exhibition, we will see how painting exhibits a universal desire to connect to the real in ways which enrich us all. Creating this focus has enabled us to uncover a number of significant themes which at first were hard to discern. In it we can see that painting is now expressing itself along the same lines as the slow food movement, meditation and unplugged music. Within the era of the digital revolution it offers a direct and contemplative connection with the hand-made, with real objects which mediate our emotional makeup. We see this most clearly in the fact that the paintings within the collection display no clear and consistent group narrative or movement other than being broadly realist, abstract and surrealist, and are instead an assembly of highly individualistic interpretations which offer visual interactions with the physical world. One interesting thing has however remained consistent. 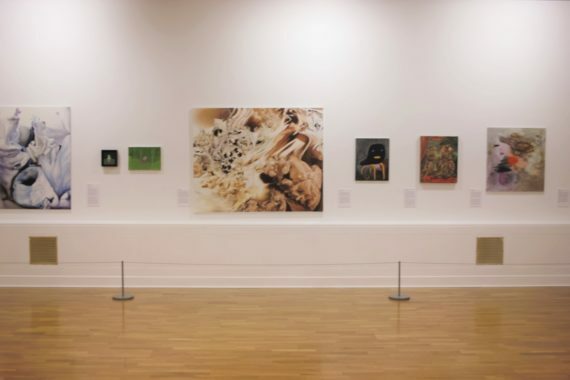 When we look to the past we notice how many of the greatest painters who practiced in the UK were born abroad, including Holbein, Freud and Auerbach who were born in Germany, Bacon who was from Ireland, Kitaj the USA and Rego who was born in Portugal. Indeed it is this international influence which has probably helped create such a strong and vibrant tradition in the genre in Britain and which is most reflective of our civilization as a broadly international and multi-cultural society. In the 21st century we see this strand of internationalism continuing in British painting and being signified in the collection by Monica Metsers who was born in New Zealand, Claudia Böse and Silvie Jacobi who were born in Germany, Laura Leahy, Jules Clarke and Julie Umerle who are from the USA, Rhonda Whitehead who was born in Australia, Ehryn Torrell who was born in Canada and Alison Pilkington who is from Ireland.